It is our pleasure to offer the 2019-20 cohort of the 4 Corners Yoga 200-Hour Yoga Teacher Training Program; a journey into learning to share the healing and empowering practice of yoga, with a focus on community based teaching. The 4 Corners Yoga Teacher Training has a mission to make yoga accessible to everyone. This innovative, trauma sensitive teacher training is an opportunity for those who want to skillfully share yoga, while being grounded in their own practice and body. Our vision is a vibrant and inspiring community of practice that nurtures, uplifts and builds resilience in our communities. This training will ask you to participate in asana classes, discussion, practice teaching, hands on assisting, reading, online and writing assignments. There is an application process for this training. Please download the application with the button at the bottom of this page. There are a limited amount of scholarships available. Please email us here for a scholarship application. The cost of the training is $3300. The early bird rate, if paid in full by 10/15/19 is $2800. A non-refundable deposit of $500 is required to reserve your spot in the training. If your application is accepted, it will be applied to your tuition balance. If your application is not accepted, your deposit will be refunded. 4 Corners Yoga Teacher Training faculty is a dynamic and synergistic team of leaders in the yoga, trauma healing and wellbeing communities. Our teacher trainers have extensive knowledge of creating yoga programs and leading classes in therapeutic settings, at places that support survivors of trauma, addiction recovery programs and organizations that strive to end homelessness, poverty and racism. Karuna O'Donnell is highly skilled teacher and teacher trainer who is recognized as a leader in the trauma healing community in Boston and nationwide.In 2008, she was awarded a fellowship for Leadership in Education to the Harvard Graduate School of Education for work with complexly traumatized youth in Dorchester, MA. During her graduate work, Karuna was employed as a consultant by the Trauma Center Yoga program at Justice Resource Institute, Boston's leading trauma center. Karuna implemented a trauma sensitive yoga and art program at Glenhaven Academy, an innovative and evidence based trauma treatment program for youth in Marlborough MA. She was selected to assist the groundbreaking Forrest Yoga Foundation Teacher Training in 2014 and the Yoga, Meditation and Addiction Recovery Conference founded by Nikki Myers and Rolf Gates in 2011 and 2014. She is certified in Forrest Yoga (Level 3), Trauma Informed Yoga and the Yoga of Twelve Step Recovery. 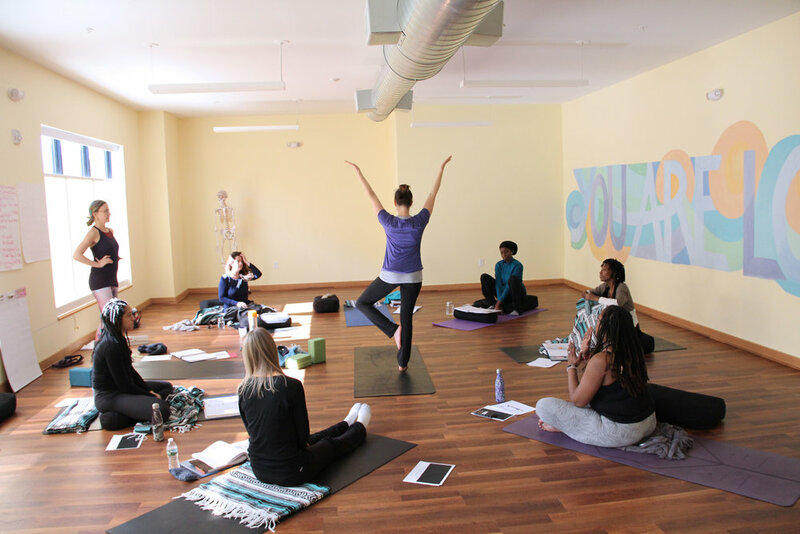 Karuna is currently providing trauma-informed healing yoga at The Meeting Point in Jamaica Plain, serving people in recovery, trauma support groups, families and youth in residential trauma treatment. Karuna is the Yoga for Trauma Specialist and founding member of Hands to Heart Center, a private, non-profit service that provides community-based yoga classes that are accessible, inclusive and inspiring. HTHC classes take place in community centers, schools, homeless shelters, post-incarceration centers and recovery programs in Boston. Launching 4 Corners Yoga + Wellness with Christine Rose is her next personal act of courage and call of her spirit. Sadada Jackson is a student of practice who lives in her body and vacations in her mind. Her yoga teacher and yoga teacher trainer is Bo Forbes. In 2008 she earned her 200-hour teacher training certificate Elemental yoga system. She has taught in Cambridge and Boston in studios, public schools, community centers and living rooms. Her desire is to create the cause and conditions for courageous returns to our body and our bodily ways of knowing with love, learning and the sharing of tradition and understanding. She holds a B.A. in Theatre with a Minor in English and a M.Ed. in Secondary Education from UMass Boston. Presently, she is a Master's of Theological Studies Candidate at Harvard Divinity School learning from Indigenous religions. "Karuna is the queen of yoga teachers who walks her talk and talks her walk. What an articulate loving being that I am blessed to have found as I learn to stretch and live in healing, joyous flow admist and within a broken and sometimes unbearably beautiful world of grace. Where does her honest and infectious connections to joy and positivity come from? Who knows. But I can guess from being her student three times a week for three years now. Perhaps her brilliant teaching practice is rooted in her own daily commitment to her various healing practices and modalities: regular meditation, a keeper of the Forrest tradition of core strength and yoga as ceremony, her philosophy and practice of healing work for racial and community justice, her sensitivity and knowledge about trauma and how to heal what is truly possible to heal. Karuna breathes, moves and speaks from these deep wisdoms and intelligences and as she practices her fearlessness and expansiveness in her own teaching and life, we all come into contact with our own unique yoga divinity. The best of it is that there is no pretense. Every word and breath and movement that Karuna guides you into and through will serve your own growing spirit and strengthening body."